Single speed start-up Mango bikes moves into the mainstream with a new 18 speed road machine. Mango bikes have built up quite a following since their launch in 2012 with a fully-customisable and attractively-priced range of single speed and fixed gear urban bikes. Now they’re bringing the same philosophy to the road bike market with a brand new geared offering. Admittedly Mango aren’t looking to break into the WorldTour any time soon, but the 18 speed bike seems like a good option for commuters with a hillier ride to work, or the first-time roadie looking for a good value ride to get them out on road. Priced at £429.99 for the flat-bar commuter and £479.99 for the drop-bar road bike, this comfortably dips below the all-important £500 mark that most entry-level road bikes strive for. So what do you get for your money? The steel frame is adorned with shifters and derailleurs from Taiwenese brand MicroShift, hardly a world-renowned company, but their TT shifters have previously been spotted in the pro peloton. The rest of the chainset is a blend of DnP cassette, KMC chain, and a crankset from Mango’s in-house Chasewood brand. Wheels and tyres are supplied by Kenda, although there’s an option to upgrade to more puncture-resistant Maxxis Re-Fuse for an extra £35. Everything else is produced by Mango themselves, helping to keep that price down as low as possible. The new Mango bikes are available in seven different pre-designed colour options ranging from classy chrome or matte white to this lime green number or the less understated black and yellow “Bumblebee”. For a little extra you can create your own custom design using Mango’s online bike builder, allowing you (and us) to dream up some pretty horrible colour combinations. 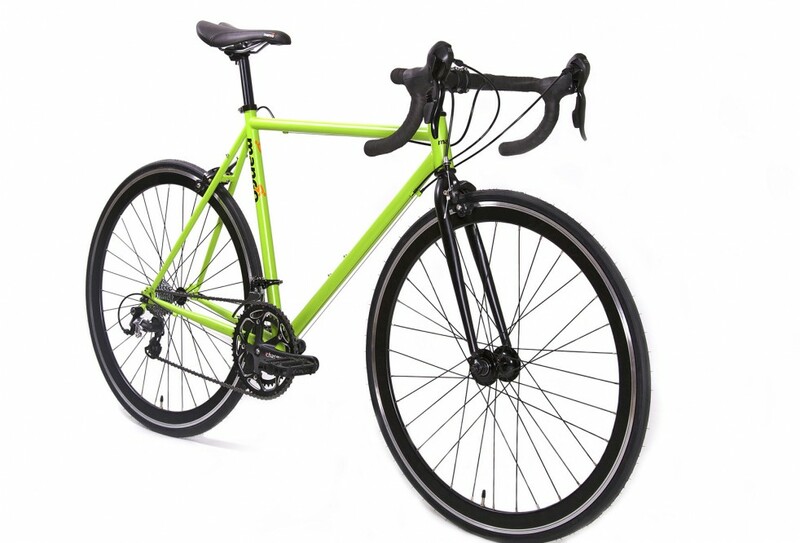 For more information on the new road and commuter bikes as well as the other single speed Mango bikes, visit their website.